De LARKSPUR Lodge is een eengezinswoning gelegen in een van de mooiste wijken van Vail's. Geniet van het uitzicht vanuit dit prachtige blokhut met een open plattegrond, een eigen 7 personen hot tub op zijn eigen dek, vier slaapkamers, twee badkamers, een garage, houtkachel, en WIFI. Gelegen in het hart van West Vail, 150 voet van de vrije stad van Vail bushalte, geen auto nodig is voor u om van en naar Vail Village en de pistes te krijgen. Dit recent bijgewerkte, door een familie gerunde vakantiehuisje maakt geen deel uit van een verhuurzwembad en wordt voornamelijk door onze familie gebruikt als een tweede huis. U zal zich bezighouden met de eigenaren direct in plaats van met een onverschillige verhuurbedrijf. Alpine en Nordic skiën, sneeuwschoenwandelen, schaatsen, wandelen, fietsen, golfen, vliegvissen en tennis zijn allemaal in de buurt, net als het onlangs gerenoveerde Gerald Ford Amfitheater. Stephen's Park en de speeltuin ligt op minder dan 5 minuten lopen van de weg. Aangekomen hoeft te rijden. Laat uw auto in de garage en loop 150 meter naar de bushalte voor de gratis, tien minuten rijden naar het hart van Vail Village. Of loop, rollerblad of fiets met de fiets het dorp in op het prachtige fietspad dat langs Gore Creek loopt. Niet roken of huisdieren toegestaan. Great place to stay in Vail! The place was clean and comfortable. Great location, just a short shuttle ride to downtown Vail and the shuttle stop is very close by. We would definitely stay again. We had our family stay here and it was wonderful. Owners are very helpful. Great location. Charming, roomy cabin in great location. ‘‘This cabin has everything that our family needed. Plenty of bedrooms, large table and nice kitchen area. Loved the large deck and hot tub!! Andy was very nice to deal with and prompt to help with any issue we had. Only negative was that we felt the cabin could have been a little cleaner. There were cobwebs in the corners and on the light fixtures. Just felt it could use a real “deep” cleaning. Overall, a nice place for us to stay, while celebrating our sons wedding. Love Vail!! What an incredible week!!! It was a ski vacation beyond our expectations!!! Beautiful home, close to bus stop, very convenient. All 8 of us want to say thank you to Andy and Meg!!! We chose this property because it seemed to fit out needs for a planned family vacation for us, our 3 adults sons, and two daughters-in-law. Andrew met us upon our arrival and was easily available. It was quaint, cozy, and comfortable, and large enough for us to be able to have our own space when needed. The kitchen and large kitchen table were just right for when we wanted to cook and eat in. The kitchen was well-supplied with cooking utensils and cookware. The fireplace was a nice feature, as were the 3 flat screen TV's - one in one of the bedrooms, one upstairs and one downstairs - perfect for gathering to what the Winter Olympics in the evening after our day in the outdoors. Access was easy either through the door with the key that was kept in a lock box, or thru the key-coded garage door. The garage is available but we kept our vehicles outside. Since the property is in West Vail, there was a short ride into Vail Village. The bus stop for the FREE bus ride to Vail Village was a very short walk from the house. The bus is a very nice feature used by many staying in the area. If you're not a downhill skier, there is cross country skiing and some non-skiers in our group even took a snowmobile tour which they really enjoyed. The hot tub was enjoyed by the family multiple times. There are plenty of towels, and a fully functional laundry room. You'll want to take a book light if you're the type that reads in bed. The spiral staircase was a cool feature, but could be a challenge to navigate if you have any difficulty walking. If you are renting a vehicle in the winter, I suggest getting a 4-wheel drive option since it will make it much easier to get around when it shows. Be aware that some of the highways leading into Vail require a 4-wheel drive vehicle under certain conditions, or, if you have 2-wheel drive you must have chains on. This cabin is FANTASTIC! 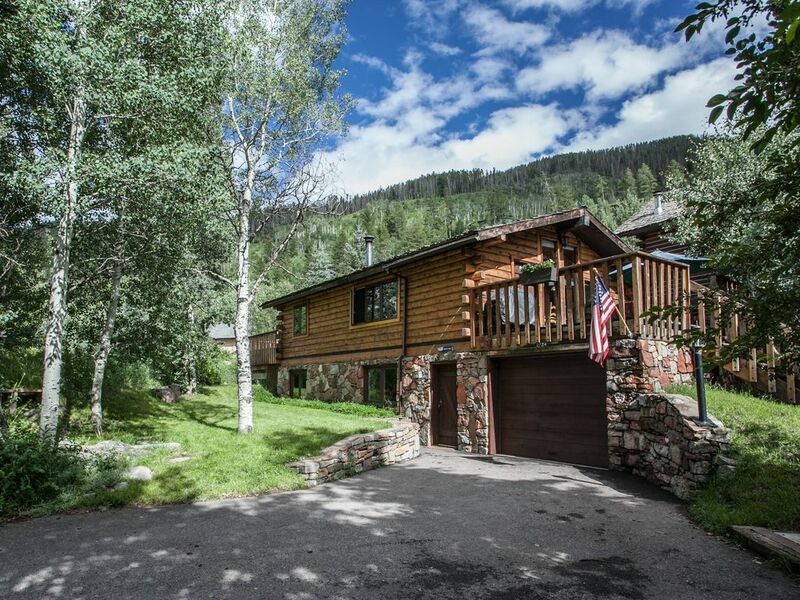 Wonderful location and steps away from the Vail bus system. Hot tub was fun! Kitchen fully stocked with everything you need! Hairdryer, sleds, towels, pretty much everything you need. Andy cane and helped us when disposal was stopped up right away! Very friendly family to rent from, I recommend this cabin! Vliegvissen van uw deur, Outdoor Ampitheater, Schaatsen en tal van fiets- en wandelpaden.